W Edwards Deming made two profound statements “Without data you’re just another person with an opinion” and “In God we trust, all others must bring data.” If you believe this mantra, why is it that BODs, CEOs and Sales Leaders ignore the sales industry data or delay using the data that is readily available to drive improved and sustainable sales results? Is the data source questionable? Was their methodology flawed? Were the number of responses insufficient to be statistically valid? Was the researched biased? Are they convinced their strategy is better than the data? Or are they stuck at the status quo until their business trends downward? 74% of B2B buyers conduct more than half of their research online before talking to a sales person. Source Forrester. 8 people are now involved in the average B2B buying decision. Source CSO insights. 75% of B2B buyers now use social media to research vendors. Source IDC. 90% of decision makers say they never respond to cold outreach. Source Harvard Business Review. 74% of buyers choose the sales representative that was first to add value and insight. Source Corporate Visions. 46% of B2B buyers believe sales people fail to understand specific buyer needs or lack relevant knowledge. Source SAP. Takeaways: The number of buyers providing input to a decision is increasing and they are better informed than ever before. This means the sales cycle is becoming longer and more complex. If you want a “seat at the table” you have to be more than a “voice in the crowd.” How an organization initially engages a buyer is important. Those that provide insight or mold the buyer’s thought process can ultimately shape the buyer’s solution. How you sell can be a critical differentiator. Sellers spend approximately 37% of their time in actual sales activity. Source CSO insights. The percentage of sales representatives making quota is down from 63% in 2012 to 58.8% in 2016. Source CSO Insights. The win rates of forecasted deals was 45% in Winning at the craps table in Las Vegas is 49.3%. Source CSO insights. 72% of wins close as exactly forecasted less than 75% of the time. Source CSO insights. 54% of sales teams have random or informal sales process. Source CSO insights. 42% of sales teams have a formalized value proposition that is very compelling to customers and prospects. Source CSO insights. The average sales cycle is 22% longer than it was 5 years ago. Source Hubspot. Takeaways: Sales professionals spend 63% of their time doing non-selling activities. This contributes to lower performance levels as measured by win rates and achieving forecast. A lack of process and lack of a formalized value proposition leaves sales professionals to try and figure out for themselves how to be successful. There is no formalized roadmap. 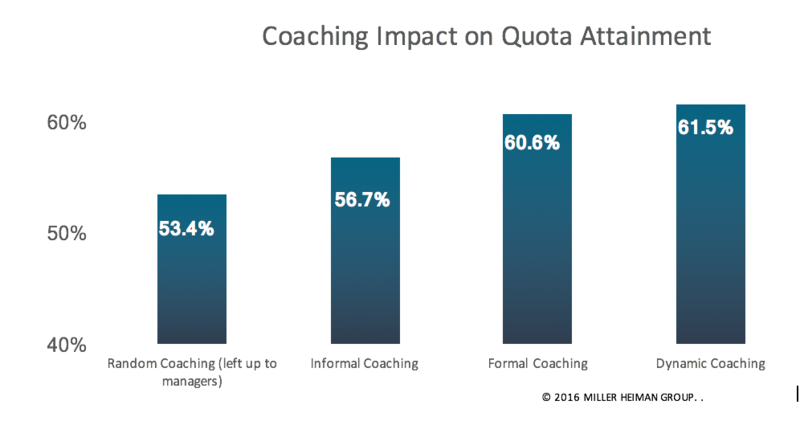 The chart above from CSO Insights illustrates that a formal or even dynamic coaching process helped more salespeople to achieve their quota by 10% while improving their win rate. 1% of managers spend less than 30 minutes per week coaching to leads and opportunities. Source CSO insights. 65% of managers spend less than 60 minutes per week coaching sellers on leads and opportunities. Source CSO insights. 74% of leading companies cite sales coaching as the most important role of front line sales managers. Source Forbes Insight. Only 24% of organizations utilize a formal coaching process. Source CSO insights. Sales teams that use sales performance coaching have 161% more wins, 26% more pipeline and 19% fewer losses. Source Salesforce. 40% of sales organization allocate the right resources to win large deals. Source CSO insights. Takeaways: Organizations believe that sales coaching is important but most don’t dedicate the time or resources to make it happen. The result is lower revenue and profits for even the companies that are making their revenue goal.